Refer to “electrical components location” in section 0a . Remove the air cleaner box. Refer to “air cleaner box removal and installation” in section 1d . Disconnect all ignition coil. Refer to “ignition coil and spark plug removal and installation” . Connect the new spark plugs to each ignition coil. Connect all the ignition coil lead wire couplers to the ignition coil respectively, and ground them on the cylinder head (each spark plug hole). avoid grounding the spark plugs and suppling the electrical shock to the cylinder head cover (magnesium parts) to prevent the magnesium material from damage. be sure that all the spark plugs are connected properly and the battery used is in fully-charged condition. the spark plug to the cylinder head. Insert the needle pointed probe to the lead wire coupler. use the special tool to prevent the rubber of the water proof coupler from damage. Connect the multi-circuit tester with the peak voltage adaptor as follows. before using the multi-circuit tester and peak voltage adaptor, refer to the appropriate instruction manual. 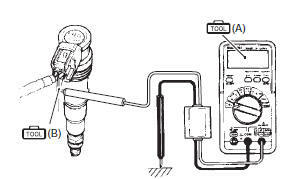 touch the tester probes and spark plugs to prevent an electric shock while testing. Shift the transmission into neutral, turn the ignition switch on and grasp the clutch lever. press the starter button and allow the engine to crank for a few seconds, and then measure the ignition coil primary peak voltage. Repeat the b) procedure several times and measure the highest peak voltage. If the voltage is lower than standard range, inspect the ignition coil and the ckp sensor. After measuring the ignition coil primary peak voltage, reinstall the removed parts. Remove the ignition coil. Refer to “ignition coil and spark plug removal and installation” . Measure the ignition coil for resistance in both primary and secondary coils. If the resistance is not within the standard range, replace the ignition coil with a new one. After measuring the ignition coil resistance, reinstall the removed parts.